There's a push on by some to promote online voting in New Zealand. I'm against it. Government has called for local government to take the lead in online voting, with the need to guarantee the integrity of the system - most notably safety from hacking - the top priority. But Hulse questioned some politicians' interest in a digital switchover. Hulse said the postal system isn't bullet-proof either. "Government seems to want absolute watertight guarantees that it is not hackable or open to any messing with," she said. "I don't know why people seem to feel somehow the postal vote has this magic power of being completely safe. It can be, and has been, hacked in its own way by people just going round at night and picking up ballot papers." I think the fears around last year's US election emphasized more than ever the importance of safeguarding the electoral process. Hacking is a greater threat than, say, people stealing postal ballot papers for a few reasons. Stealing postal ballots is necessarily risky. A thief must be physically present and there is a risk of being caught. In contrast, many hacks can be done from anywhere and it's relatively easy to conceal the source of the attack. The risk and effort required to steal ballots is proportional to the number of ballots stolen. In contrast, successful hacks are often easy to scale up to achieve any desired effect with no extra work or risk. Some fraction of people are likely to notice their postal ballot went missing and notify the authorities, who can then investigate, check for other missing ballots, and invalidate postal ballots en masse if necessary. Hacks against online voting systems can be much more stealthy. People systematically overestimate the security of electronic systems, partly because a relatively small group has the background to fully understand how they work and the risks involved --- and even that group is systematically overconfident. A spokeswoman for the Mayor's office said Goff was not available for comment due to other commitments this week, but said the Mayor endorsed the push for online voting. Deputy Mayor, Bill Cashmore, also said while there is no clear timeline on when a trial might run, online voting is also something he would like to see introduced - pointing out it would probably be well-received by young voters and a good way of maximising the reach of the democratic process. That's all very well, but confidence in the integrity of the voting process is also an important driver for participation. The fundamental problems with online voting are well-understood by the research community. The NZ Government should continue holding the line on this, at least for Parliamentary elections. For local body elections (which the Mt Albert election is referenced above is not), voter participation is so low you can make the argument that reducing the integrity of the election is worthwhile if online voting significantly increases the participation rate. However, there is evidence it may not. 306 Points In "Lords Of Waterdeep"
A new record for our household. It was a three-player "long" game. Nine Plot Quests is probably too many but they were good value and created a lot of synergies. 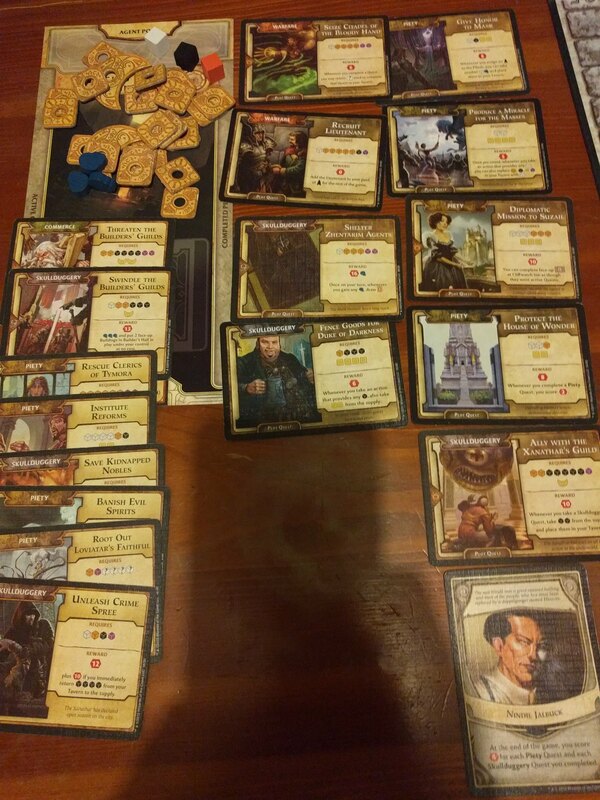 The most important quest was Shelter Zhentarim Agents, which I completed first; I probably drew about 15 corruption during the game, so had a constant supply of Intrigue cards, and with only two other players I was able to play two or three Intrigues per round (a couple of buildings with play-Intrigue helped). I also completed Seize Citadel Of The Bloody Hand early and Recruit Lieutenant in the fourth round. I discovered a nice trick after completing Fence Goods For Duke Of Darkness and building Hall Of The Three Lords: arrange to have three or four turns in a row (the Lieutenant usually plays last after the other players have placed their agents, then you can reassign agents from Waterdeep Harbor), then place an agent on Hall Of The Three Lords and place three rogues on three vacant action spaces for ten victory points. In your following turns, place your agents on those action spaces and scoop your rogues back up as well as taking the benefit of the action; Fence Goods For Duke Of Darkness gives you two gold for each one, so you get a bonus six gold. If one or two of those action spaces are The Librarium or other buildings that let you take resources and place additional resources elsewhere for your next agent to pick up, so much the better. A recent issue of New Scientist has a headline article on "The Meaning Of Life". It describes research showing correlations between a sense of purpose and various positive attributes such as health and happiness. It then touches on a few ways people can try to enhance their sense of purpose. As human beings, it is hard for us to shake the idea that our existence must have significance beyond the here and now. Life begins and ends, yes, but surely there is a greater meaning. The trouble is, these stories we tell ourselves do nothing to soften the harsh reality: as far as the universe is concerned, we are nothing but fleeting and randomly assembled collections of energy and matter. One day, we will all be dust. Quite so --- assuming a secular worldview. In that context, the question "what is my purpose?" has no answer. The best you can hope for is to grab hold of some idea, make it your purpose and refrain from asking whether you have chosen correctly. To me, even before I became a Christian, that approach seemed unsatisfactory --- too much like intentional self-delusion. To conclude "there is no greater meaning" and carry on as if there is didn't seem honest. Later I came to believe that Christianity is objectively true. That means God has created us for a specific (yet broad) purpose --- "to glorify God and enjoy him forever", in the words of the Westminster Shorter Catechism. The question has an answer. We'll spend eternity unpacking it, though. This defines an aggregate type containing a field y of type Y directly (not as a separate heap object). Then we define a getter method that returns the field by reference. Crucially, the Rust compiler will verify that all callers of the getter prevent the returned reference from outliving the X object. It compiles down to what you'd expect a C compiler to produce (pointer addition) with no space or time overhead. As far as I know, no other remotely mainstream language can express this, for various reasons. C/C++ can't do it because the compiler does not perform the lifetime checks. (The C++ Core Guidelines lifetime checking proposal proposes such checks, but it's incomplete and hasn't received any updates for over a year.) Most other languages simply prevent you from giving away an interior reference, or require y to refer to a distinct heap object from the X. This is my go-to example every time someone suggests that modern C++ is just as suitable for safe systems programming as Rust. Update As I half-expected, people did turn up a couple of non-toy languages that can handle this example. D has some special-casing for this case, though its existing safety checks are limited and easily circumvented accidentally or deliberately. (Those checks are in the process of being expanded, though it's hard to say where D will end up.) Go can also do this, because its GC supports interior pointers. That's nice, though you're still buying into the fundamental tradeoffs of GC: some combination of increased memory usage, reduced throughput, and pauses. Plus, relying on GC means it's nearly impossible to handle the "replace a C library" use case. We just released rr 4.5.0. Massive thanks to Keno Fischer who probably contributed more to this release than anyone else. This is another incremental release. rr is already pretty good at what it does --- single-core recording, replaying, and debugging with gdb and reverse execution. The incremental nature of recent releases reflects that. It's still a significant amount of work to keep updating rr to fix bugs and cope with new kernel and hardware features as they start getting used by applications. Notably, this release adds support for Intel Knights Landing and Kaby Lake CPUs, contains a workaround for a regression caused by a Linux kernel security fix, and adds support for recording software using Hardware Lock Elision (and includes detection of a KVM bug that breaks our HLE support). This release also contains a fix that enables recording of Go programs. We have some encouraging reports of rr adoption and rr users pretty much ceasing use of standalone gdb. However, rr definitely needs more users. When hardware and OS issues crop up, the bigger the user-base, the easier it will be to get the attention of the people whose cooperation we need. So, if you're a happy rr user and you want to help make sure rr doesn't stop working one day, please spread the word :-). Let me say a tiny little bit about future plans. I plan to keep maintaining rr --- with the help of Keno and Kyle and other people in the community. I don't plan to add major new user-facing functionality to rr (i.e. going beyond gdb), but rather build such things as separate projects on top of rr. rr has a stable-in-practice C++ API that's amenable to supporting alternative debugger implementations, and I'd be happy to help people build on it. I've built but not yet released a framework that uses parts of DynamoRio to enable low-overhead binary instrumentation of rr replays; I plan to keep that closed at least until we have money coming in. The one major improvement that we expect we'll add to rr some time this year is reworking trace storage to enable easy trace portability and fix some existing issues. ... and other door-to-door evangelists. I just had a couple of JWs visit me. I always cut through the script by asking door-to-door evangelists who they're with. Anyone who won't tell me straight-up I'd shoo off immediately, but people generally are open about it. On hearing they were JWs, I confirmed that they don't believe Jesus is God and asked them what they make of John chapter 1. We fenced amicably about those issues a little bit and I think they decided I wasn't worth their time. Of course I think JWs are totally wrong about this key doctrine. However, I really admire the zeal and fortitude of anyone who does honest door-to-door evangelism, because I've done just enough of other kinds of evangelism to know how hard it would be. I believe that these people are at least partly motivated by genuine love for the lost. As Penn Jillette observed, if you think you've come across truth that's life-changing for everyone, only a coward or a criminal would fail to evangelize --- though door-to-door may not be the most effective approach.